Today, in the second part of my report on our beach trip, I get pretty sappy for someone who usually rolls her eyes at the advice to “enjoy every minute, time goes so fast!” You’d better read it before I change my mind. As I mentioned in my last post, we had a great time at the beach, and I came away renewed, even after a week with a house full of kids under age eight. I partially owe this sense of renewal to the fact that I managed to sneak away to the beach by myself for about an hour to relive the days of “before kid” (BK) beach vacations. The BK ritual consists of sitting on the beach with a book until I’m so hot I can’t stand it anymore, floating in the ocean for a while, then going back to the book. Rinse and repeat, if you will. If it were truly a BK vacation, there would be mid-day cocktails involved. But now I wait until 5:00, lest I pass out in my evening plate of Goldfish. But it’s close. Last year, I spent the time in the water thinking about what to do about my job. I had just gone back to work from my maternity leave with Rory. There was an opportunity for advancement on the table for my consideration. I remember floating out past the breakers, trying to craft a plan. Well, I could try it, throw myself into it, and just plan to stick it out until x date. By then, we’ll have x childcare, and will have x money, and it will be worth it even if it doesn’t work out. That kind of thing. I ended up turning down the opportunity, which, completely fairly, put me in a vulnerable place when layoffs came around ten months later. At that time, I probably couldn’t have imagined that in less than a year, a choice would be made for me, and it would lead me to staying home with my kids and spending out lot of time trying to figure out what to do next. Just little ol’ me collecting shells. In my free time at the beach this year, in addition to reading and floating, I developed a bit of an obsession: collecting seashells. Well, not shells, exactly, but these smooth, translucent stones that covered the sand. I selected each one carefully: some were as large as half-dollars, but my favorites were much smaller. Barely pebbles, the size of jelly beans. And let’s face it, that’s probably what attracted me to them: the idea of a beach covered in Jelly Bellies. Pina Colada, Black Licorice, Buttered Popcorn. 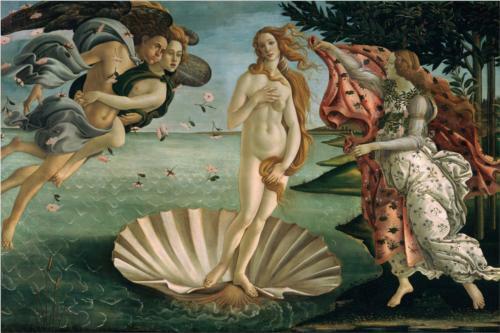 Imperceptible compared to the Birth of Venus shells everywhere, but impossible to miss once you were looking for them. The seashore is an amazing thing. I usually focus on the ocean: the hypnotic crashing of the waves, the expanse of blue that seems to go on forever before meeting up with the horizon. But last week, I became fascinated with where the sea met the land. How each wave brings a gift to the shore, leaving there in the sand an unlimited supply of treasures, free to anyone who stops to take them. And the water perpetually replenishes the inventory: you can walk down a stretch of beach, convinced you’ve picked the most beautiful shells, and upon returning a few minutes later, a whole new set has appeared. The opposite also applies, of course: more than once I reached down to pick up a smooth, round stone only for a wave to sweep over my hand and pull it back out to sea. Because I’m not above a corny metaphor, I’ll admit that I was struck by the parallel. This was our fifth year of a beach trip with kids. It was shocking at first how the definition of “vacation” changes when you add children to the mix. Each year, we find ourselves talking about how much easier the following year will be. And sure enough, as we lugged all 28 pounds of Rory up the stairs from the beach, or watched him toddle around the house, always teetering precariously toward the stairs, eating a marker or chewing on the remote control, we daydreamed about what it will be like next year when he’s two, walking confidently and speaking in more-or-less understandable phrases. But other things will be different in the upcoming years: I won’t be lifting Rory out of the crib in his diaper, squishing his preternaturally doughy thighs. Or hearing him say words for the very first time (on this trip: “bubble”). And it won’t be long until Noah no longer clings to my hand as we stand in knee-high water, or begs me to pick him up as the waves crash harder, allowing me a salty kiss on his cheek. He won’t ask for me to snuggle him in front of all of his bunk mates, or spend the car ride home making up stories about his matchbox cars. These moments are constantly left for me like shells on the shore. There are so many, I can barely take them all in. And with each passing year, each day, really, these moments become the past, rushing back out to sea. Yes, they’ve been captured in diligently snapped photographs, iPhone videos, and the occasional baby book entry. But they will not appear on my shore again. Only at this very moment are they mine for the taking. Sigh. Lovely and what a wonderful parallel. Those boys are BEAUTIFUL. You guys did such an amazing job.